After bumming around in commission-only jobs since leaving university, I decided that it was about time for me to get a ‘proper’ job. The type with benefits and my own desk… And an uncomfortable headset connected to an automatic dialler. Three bloody weeks of it! Quite why they thought it necessary to take quite so long to bring the new recruits up to speed is beyond me. Especially when we were told in no uncertain terms that we had a tried-and-tested script to stick to. No deviation. In between never ending role play scenarios, I wondered if life really had to be quite so dull. Then finally I made it to the sales floor. I was given a spot next to the best sales person – a beast of a girl with a face fit for telephone sales. She had a talent for sounding like she really cared about the customers she was calling, whilst simultaneously filing her nails or squeezing her spots. I wondered: a) how she kept up her enthusiasm; and b) what her husband looked like. But the worst thing about the job was the quality of the call lists. Dealing with an ageing pool of potential customers throws up some inevitable problems. Some of them have no recollection of requesting a call back. Some of them have died. Recently. In fact one colleague called to speak to a Mr Smith and was told: “He is here. But you can’t speak to him as we are holding his wake.” I’m pretty sure being dead invalidates insurance, so no sale there. One day I seemed to be making good progress on a call. The wife seemed all set to accept my quote and sign-up. But then she said that the policy was always in her husband’s name, even though he wouldn’t drive. I had to put him on the policy too. No problem. I entered all his details and proceeded to the payment details. But I asked out of curiosity, why wouldn’t the husband drive? “He’s registered blind” came the reply. She was trying to buy insurance for a blind driver. 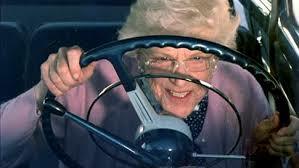 Unbelievably she seemed surprised when I said that no-one would insure a blind driver! Call us pedantic, but we consider it to be slightly risky. But she wouldn’t go ahead without his name being on the policy. No sale. Needless to say, I couldn’t stomach the job for more than three days. My notice period was one week. So my employment lasted for three weeks of training and a mere eight days on the sales floor. To cap it off, my jobsworth line manager insisted that I complete a first week review, even though I had resigned, asking me such questions as “What areas do you think you can improve on… er, in your last two days” and “How have you found the role?” What did they expect me to say?! I couldn’t get out of the door quick enough. Phoning up dead people is not my idea of a good job. Thanks for your comment – I’ll check out your site.